Routine optical exams are an important part of overall eye care, so it’s important to see your eye doctor in Chicago regularly. Doing so can help keep your eyes healthy by detecting problems, such as glaucoma, in their early stages. Read on to learn more about this eye disease. Glaucoma typically results due to fluid buildup that increases the pressure in the eye and causes damage to the optic nerve. The early symptoms of glaucoma are often minor or non-existent, so many people do not realize that something is wrong with their eyes until the disease has become advanced. Because glaucoma progresses slowly and often develops unnoticed, it’s important to visit your ophthalmologist regularly for exams. When caught early, glaucoma treatment can help preserve your vision. The most common form of this disease is called open-angle glaucoma, and it usually has no symptoms while it’s in its early stages. Eventually, the damage to the optic nerve begins to cause blanks spots in the individual’s vision, but even these are difficult to notice until they become substantial in size. Another form of this disease, called angle-closure glaucoma, can cause an acute attack. These attacks can result in nausea, vomiting, severe eye pain, blurry vision, headache, and rings or halos around lights. If you experience any of these symptoms, see an ophthalmologist immediately. The inside of your eyes are lined with a layer of tissue that is sensitive to light, called the retina. The optic nerve, which is composed of many nerve fibers, runs like a cable between your retina and your brain, communicating signals from the eye, which your brain then interprets as images. The front portion of an eye contains a clear fluid called aqueous humor. A healthy eye continually produces new aqueous humor, while draining out the existing fluid at the same time. This process works to maintain the healthy balance of pressure within the eye. 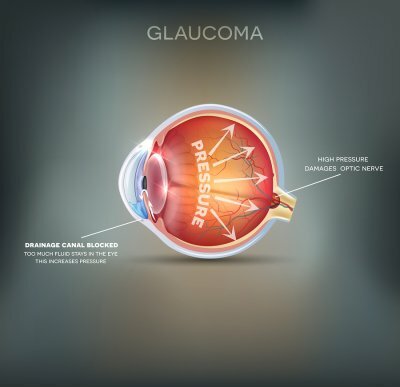 Eyes with glaucoma, however, fail to preserve this balance, and the added pressure damages the optic nerve fibers and leads to reduced vision or blindness.